Nice job on that strap, Stefan! It wouldn't have occurred to me to do it like that, and it looks good. Did you glue/ heat seal it as well as the stitching? Yeah, I heat sealed it, but wasn't too happy with how it turned out, so I added the stitching just in case. 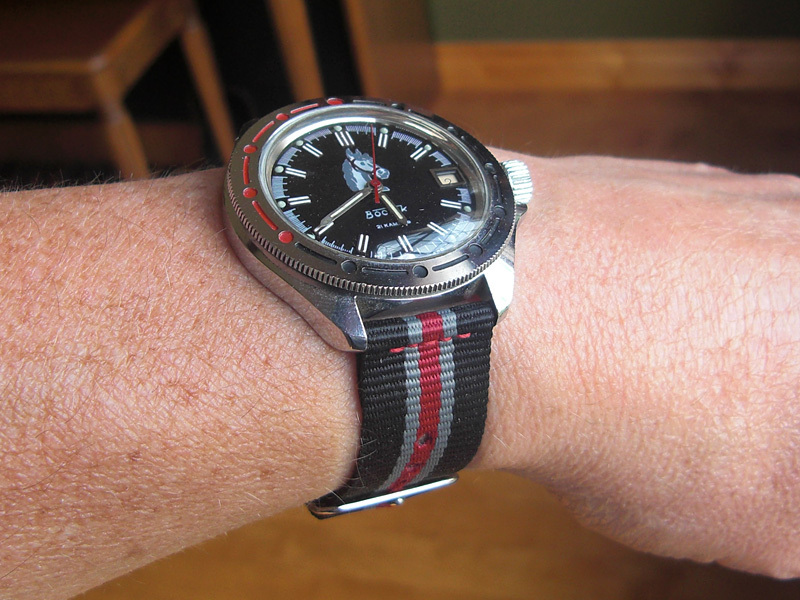 This is my third attempt at a NATO-to-normal strap conversion, and so far, the first one turned out best. The second one I accidentally nicked the side of the strap with the soldering gun, and this one I didn't heat seal the joints well enough (because I was afraid of nicking the strap again). I took a lot of pictures, and plan to write up how I made the strap though. Here's my NATO mod, on a sub Dirskie from Amil. Last edited by OhDark30; July 3rd, 2013 at 20:37. My only komandirskie on two piece nylon strap. soulbazz, jose-CostaRica and Don Logan like this. Audio Enthusiast AND Watch enthusiast. Last edited by mp34me; July 5th, 2013 at 01:14.
whetrock and Don Logan like this. "Made in USSR" and the Desert Shield...? I know the USSR(which does not exist anymore) and the US were enemies. but doesnt it seem ironic for the former USSR actually commemorating former-Enemy "soldiers" or counter-productive. But anyways, nice Zulu to match the watch, it has a great military look to it.